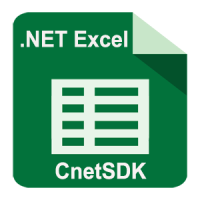 CnetSDK .NET Excel SDK is just like a combination of Excel creator, reader, writer, and editor components/controls for .NET, C#, VB.NET, ASP.NET, and WPF applications. This advanced .NET Excel spreadsheet control library integrates robust programming APIs for software developers to read, create, write, and edit Excel (XLSX/XLS) spreadsheets. CnetSDK .NET Excel SDK performs very fast on large Excel spreadsheets. CnetSDK .NET Excel spreadsheet control library is suitable for many .NET projects programmings, such as ASP.NET web, .NET Windows Forms, and WPF applications. After integrating Microsoft Excel editor control dll into your .NET project, you can create, read, write and edit Excel workbook/spreadsheet using C# or VB.NET programming language. CnetSDK .NET Excel editor control dll is a standalone library for .NET Excel spreadsheet programming. And Microsoft office or other third party Excel editor libraries/components/controls are not required to be installed on your PC or servers. You can directly download CnetSDK .NET Excel SDK free trial from the above download button, and then add CnetSDK.Excel.Trial.dll component to your .NET project reference. For the free trial of .NET Excel Editor SDK, you can only read and write the first 200 rows of Excel spreadsheet. To fully edit Microsoft Excel, you should order a license of CnetSDK .NET Excel SDK online. A demo project is included in the trial package of CnetSDK .NET Excel editor control. This demo project provides examples of all the features of Excel (XLSX/XLS) spreadsheet component library. Please directly refer to it and have a quick start. To be more specific, you will see .NET programming examples for the following MS Excel spreadsheet modification aspects. We provide .NET programming demos for creating new Excel document from the local file and byte stream; tells how to load and read Excel document object from file and stream. You will see detailed .NET demos for how to use .NET Excel spreadsheet component dll to edit, update, and format cell data of Excel spreadsheet. In addition, you will learn how to insert a formula into a cell. CnetSDK .NET Excel library control enable C# & VB.NET software developers to import and export Excel spreadsheet for further usage. More specifically, C# & VB.NET software developers can import SQL Database, DataTable, and DataSet to Excel, and export Excel to them.